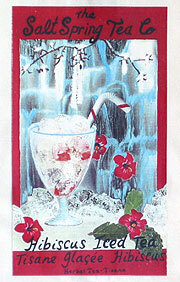 Salt Spring Tea Company Ltd. The Salt Spring Tea Co. Ltd. originated approximately 10 years ago on Salt Spring Island and was developed by local artisans. We still hand produce the products, including packaging wherever possible. 16 Unique Herbal Blends created with the finest ingredients. 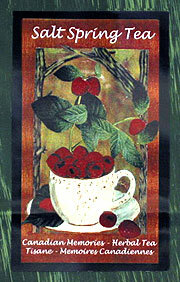 Available in Hand-painted Bags of tea, Hand-painted wooden Tea boxes, or Kraft corrugated pouches. 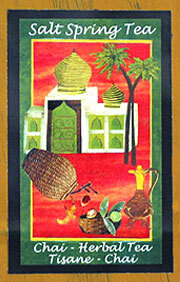 Each unique bag contains 3 muslin bags which make a total of 6 litres of thirst quenching Herbal Iced Tea. Legend says that in 2737 B.C. Emperor Shen Nung was boiling his water one day when the leaves from a nearby tree fell into the cauldron - the first known discovery of tea. A superior blend of Chinese green tea. Enjoy! 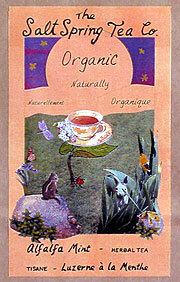 In tune with all things natural, these blends of Organic Tea bring you the true taste of Mother Earth. As pure as Nature intended. 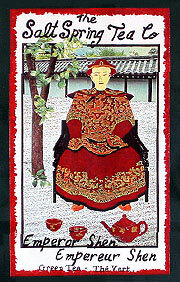 Click on the tea images to get a closer look at our special labels. Contact Salt Spring Tea Company Ltd.